After so long, it’s great to see signs that Two of the Deadliest is sliding into the home stretch toward publication. It might be coming out in the U.K. first for all I know, because the U.K. edition’s cover art is available online. Good looking cover, isn’t it? Many of the writers that Elizabeth George invited to participate aren’t mystery writers, per se. But that’s marketing for you, eh? I’m smiling because I can’t believe how excited I am to see this baby in print! I wrote my story way back in August/September 2007. The original pub date was set for April, 2008. Then, we were looking at April, 2009. Next month! But, alas, no…July? This is what the HarperCollins site states, but I heard it might not see life until the fall — in hopes that the economy stabilizes, maybe even improves some? I’m so excited for you! Nice job Lis! Congrats on this Lisa! How satisfying to finally see some real progress toward it being in print. Wonderful! I hadn’t seen that! You know, the economy would stabilize a lot faster if they would publish the thing so readers could BUY it! Hi Susan, nice to hear from you. I know really: publish it already, let people spend their money on it! So very exciting, Lisa! 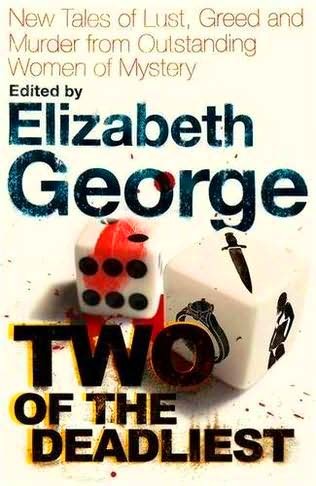 Elizabeth George is one of my favorite mystery authors, so I can’t wait to read your story, and all the others in the collection! Congratulations and best of luck! Looks like a very exciting read! Hi Lily–it will be fun read. I can’t wait to see what all the other contributors came up with! Oh good, Becca, I’m glad you like Elizabeth George. I’ll be curious what you make of the collection if you write about it on your blog. Wendy, welcome. I’ve seen your comments on Susan’s blog. Now I’ve got your on my list too! Great news, Lisa! Can’t wait to read it when it’s out. Thanks, Tanya! I’m looking forward to see what others came up with around the theme of the anthology (greed and/or lust).